REAL MADRID DROPPED points in La Liga for the second match in succession after they were held to a 0-0 draw by bitter rivals Atletico Madrid at the Santiago Bernabeu. Julen Lopetegui’s men were hoping to bounce back from a 3-0 defeat to Sevilla, but their performance in El Derbi was not hugely improved and they had to rely on Thibaut Courtois’ excellence on several occasions just to get a draw. Atletico looked significantly more dangerous in attack during the first half and only failed to take the lead because of Courtois’ efforts, denying Antoine Griezmann and Diego Costa in one-on-one situations. Madrid withdrew Gareth Bale at half-time, the Welshman suffering a suspected thigh injury, but edged proceedings in the second period and attacked desperately towards the end, though they wasted their rare chances and Atletico held on to a deserved point. The visitors had much more about them going forward in the first half and Courtois – facing his former side for the first time since returning to LaLiga – was kept busy. Saul Niguez first tested him from 25 yards with a stinging drive, before the Belgian raced off his line to thwart Griezmann. Courtois also got the better of Costa in a similar situation eight minutes before the break, with Griezmann releasing the Spain striker with a defence-splitting ball. Bale’s replacement Dani Ceballos injected some much-needed energy to the Madrid’s attack and they should have gone ahead in the 65th minute, only for Jan Oblak to make a save at the feet of Marco Asensio following Toni Kroos’ fine pass. Seemingly frustrated by their team’s struggles in front of goal, the home fans began chanting Cristiano Ronaldo’s name towards the end, and a debut for 18-year-old Brazilian Vinicius Junior could not inspire a breakthrough. Following the exit of Ronaldo, many suggested Atletico could legitimately claim to have a better squad than their neighbours, something they could have only dreamt of until recent years. Saturday’s game gave every indication Atletico look much better prepared for a title challenge than Lopetegui’s men, who appeared to have no plan B and lacked pace in the final third. Out of La Liga’s ‘big three’, Diego Simeone’s side look the most likely to go the distance. Madrid face a long journey to CSKA Moscow in the Champions League on Tuesday, before travelling to Deportivo Alaves in LaLiga four days later. Atletico have Club Brugge in Europe, with Real Betis their visitors in the league next Sunday. Email “Real Madrid drop points again as Courtois stars in Madrid derby”. 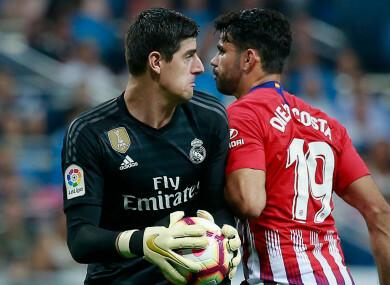 Feedback on “Real Madrid drop points again as Courtois stars in Madrid derby”.